Nikon announced the new 10.2 megapixel Nikon D60 on January 29, 2008. Rather than creating an entirely new DSLR that’s a true “step up” from the Nikon D40x, Nikon settled on the solid 10.2 megapixel sensor that has made the D40x such a great camera and “upgraded” the rest of the camera to include next generation features like built-in sensor cleaning, built-in filter effects, Active D-Lighting (featured in the Nikon D3/D300) and 3D Color Matrix Metering II (also from the D3/D300). For more info, check out the reviews, resources and other info below. Stay tuned to this page for the latest reviews, news and other resources for the Nikon D60. Like the D40x before it, the Nikon D60 is a real gem. Consumers should want one, intermediate photographers should want one, and pros would do well to carry one too. The Nikon D60 is one of the finest “family” cameras on the market, easily upholding the standards of its predecessors, which is a tall order. Imaging performance shines when it comes to noise, and the responsiveness while shooting is exceptional for a camera in this class. However, the D60 also lagged in several equally important areas, including white balance and dynamic range. With an Excellent rating on JPEGs from ISO 100 to 1600, the D60’s image quality tested slightly better than the D40x’s. That’s impressive, since the D40x also had Excellent image quality up to ISO 1600. Those looking to make a first class entry level DSLR purchase need only know that the Nikon D60 is an excellent choice – it’s small, light, affordable, easy to use and has enough solid and fun features to get any enthusiast going. Although current Nikon D40x users will probably not feel the need to upgrade, taken on its own merit, Nikon D60 is up there with the best entry level DSLR, if not the best. The new Nikon D60 is quite impressive for an entry-level dSLR, offering superb performance, great image quality, and multiple exposure options. The 3fps continuous drive mode (or 3.5fps in our testing), Sensor Cleaning system and onboard HELP Menu are distinct improvements for this soon to be popular camera. We think that image quality is key and here we like what we see. Once we got over the missing AEB feature :-) we started to like the D60 a lot. For us the natural sharpness of this camera can produce counts more than any missing feature. Despite modest improvements in performance and a couple of new features, Nikon’s D60 fails to impress and costs more than some competing models. There’s a few nice new features, and bundling the new ‘VR’ (stabilized) version of the kit lens is a smart move that makes the whole package a lot more appealing, but it’s fair to say that the D60 is a subtle upgrade rather than a wholescale reinvention of Nikon’s entry-level best-seller. It’s very easy to use, handles well and produces great looking – if slightly over-saturated – images in its fully automatic modes. As such it’s an ideal model for first-time DSLR buyers who are perhaps upgrading from a point and shoot. Ultimately the new Nikon D60 remains an intuitive camera that clearly meets the main needs of its target audience, whilst still retaining enough complexity to allow your photography to grow and improve in the future. Pictures from the D60 impress, with a lovely smooth tonality and crisp punchy colours. Contrast is generally good, while the Active D-Lighting quickly takes care of those that need a little help to achieve their best. Exposures are generally good, though occasionally the camera underexposes by a quarter to half a stop, especially if there’s a lot of brightness in the image such as a bright sky. The new EXPEED processor has worked a treat on the lower ISO ratings with super smooth results on ISO100 and 200. A very very faint sharpening begins to appear on ISO400 but only at full size enlargement. Their is still plenty of detail in the petals even at ISO800, even though the noise has started to show. Apart from quality, price will also play a big role in your decision as to which camera to buy. In my opinion the Nikon D60 is absolutely a recommendable camera. The facts prove it; convincing image quality, a great deal of user’s ease and an excellent price/quality ratio. I think it makes the D60 a highly attractive combination. Because handling and ergonomics are so good and the camera is very simple to use – left on Auto, it is as simple to use as point and shoot compact – it’s sure to appeal to those wanting that bit more from their hobby than mere snaps. And it will offer a helping hand to those trading up from, say a compact camera. From our quick hands on with the Nikon D60, we have no doubt that this camera will deliver as promised and bring a whole new legion of fans. We are especially impressed with the AF-S DX Nikkor 18-55mm f/3.5-5.6 VR lens that comes bundled with the Nikon D60 kit package, delivering excellent sharpness and colour detail overall for a lens in this price range. D60 adds active d-lighting that helps maximize dynamic range by adjusting exposure to retain highlights then boosting shadows. It also adds a digital rangefinder that indicates subject distance when manually focusing lenses. A stop-motion mode lets the camera clump individual frames together as an animation – the first time we’ve seen this feature on a DSLR. With 10.2 megapixels and remarkable compactness, the D60 offers incredible picture quality, extensive built-in dust reduction technologies and a comprehensive set of creative options. TOKYO – Nikon Corporation is pleased to announce the D60, one of the smallest Nikon digital SLRs ever. The D60 makes it fun and easy to take breathtaking pictures while also offering plenty of features for those who want to deepen their interest in creative shooting. With a split-second shutter response, the D60 captures pictures that cameras with longer time lags miss. Ease of use and creative options both come standard with the D60, whose exclusive Nikon technologies help deliver high-quality pictures with vibrant color and stunning, edge-to-edge detail. Such superior results are achieved through a high-resolution image sensor utilizing 10.2 megapixels, world-famous NIKKOR lenses delivering razor-sharp pictures, and many cutting-edge Nikon features to further enhance your picture-taking experience. Nikon’s advanced 3D Color Matrix Metering II ensures consistently balanced exposures for images with natural color and contrast, while Nikon’s new digital image processing concept, EXPEED, makes it possible to deliver smoother tones and more accurate colors. Nikon’s fast, quiet and precise autofocus system adds significantly to the performance of the D60, capturing exact moments with astounding clarity. Such clarity is reinforced by Nikon’s dust reduction countermeasures. To avoid picture-degrading dust particles accumulating near the imaging sensor, the D60 comes equipped with the innovative Image Sensor Cleaning function and Nikon’s exclusive Airflow Control System. These functions both reduce dust accumulation to give you even better picture quality. In addition to new dust reduction features, the D60 offers a variety of ways to experience more fun and creativity when taking pictures. Users can easily capture dynamic images in different shooting situations with a simple turn of the mode dial. The Retouch Menu offers even more creative excitement, letting you change your pictures into even more striking images – all fast, all simple and all without the need for a computer. Compact and comfortable, the D60 has so much to offer: amazing picture quality, simple operation, an Integrated Dust Reduction System for clearer pictures and an extensive selection of creative features. The result: fun, fantastic and inspired pictures. The world of stunning photography is just a step away, with the Nikon D60. The D60’s image sensor utilizes 10.2 megapixels to produce superb, high-quality images with incredible resolution, allowing you to make large prints, even if you only use part of an image. And thanks to EXPEED, Nikon’s unique digital image processing concept, your pictures will contain fine detail and smooth, natural tonal reproduction. The Airflow Control System used in the D60 leads air within the mirror box towards small ducts near the base, directing dust away from the image sensor. The Image Sensor Cleaning function also reduces dust accumulation near the sensor using specifically determined vibrations, which activate automatically or whenever the user chooses. This team of dust reduction countermeasures lets the user switch lenses confidently, taking advantage of the extensive lineup of NIKKOR interchangeable optics while worrying less about the effects of dust in the camera. The D60’s new Active D-Lighting feature can adjust the look of the final image while you shoot. This automatic process works in the highlight and shadow areas, compensating for difficult lighting conditions and producing optimized exposures with rich, smooth detail. The D60 is not just compact; its shape is ergonomically designed to fit in your hand naturally and comfortably. 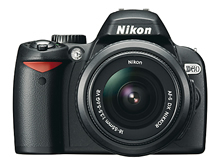 The body design is inherited from the highly regarded Nikon D40 series. The bright and clear viewfinder ensures precise composition, while the large, 2.5-in. LCD monitor displays an easy-to-use menu system with a wide viewing angle so that anyone can navigate the settings and view images with ease. The new Eye Sensor function turns off the LCD monitor when the viewfinder is used. When the user moves away from the viewfinder, the LCD monitor turns on again automatically. The D60’s Retouch Menu offers many exclusive in-camera editing features to choose from. Use the Filter Effects option to intensify a color (Red/Green/Blue) of your choice, or try the Cross Screen feature to produce star-like lines radiating from brightly lit objects in the image. In-camera NEF (RAW) processing is also available. RAW format images are “developed” within the camera after shooting, allowing you to control specific aspects of your pictures, such as image quality, image size and white balance. With the new Stop-motion feature, a stop-motion animation (the consecutive playback of still images) can be created from a sequence of images (in JPEG format). Also included is a convenient Quick Retouch option, which enhances contrast and saturation, to improve images without using a computer. The D60’s extensive Retouch Menu increases the fun and creative freedom of using a digital SLR. Frame advance rate Up to 3 fps (by selecting manual focus mode, rotating the mode dial to S or M, selecting a shutter speed of 1/250 s or faster, and using defaults for all other settings). TTL for digital SLR using 420-segment RGB sensor: i-TTL balanced fill-flash (with metering other than spot) and standard i-TTL flash (with spot metering) are available with built-in flash, SB-800, SB-600, or SB-400, and CPU lenses. Auto aperture: Available with SB-800 and CPU lenses. Flash modes Front curtain sync, slow sync, rear-curtain sync, red-eye reduction, red-eye reduction with slow sync. I would bump up to the D300, but I love the size of the D40. If they could improve the AF, by adding a few more zones, and do the anti-chromatic abberation in the D300, then yeehaw, we’ll have a winner. Could maybe throw in a LCD protector as well. I bet it won’t take all lenses, one of the hassles of the D40x. Problem with a D60 as a replacement for the D40x is making it be more than a cosmetic replacement. In other words, why replace it if not much of any substance will be added? D40x owners would be pretty upset I think. As a D40x replacement to make sense, the D60 ought to at least auto focus and meter with AF lenses. That alone could really doom the D40. Add commander mode so that the camera can control the Speedlight flashes wirelessly, and voila! Pretty cool. A few more focus areas, say up to 8 or 9, and a small increase in FPS (say 3-4), and you have a great beginning camera to stay in the ring with Canon’s Rebel line (of course the Canon Rebel XTi still has sensor dust reduction). Add the rumored 16-85 AF-S VR Nikkor Lens as a Kit lens and it starts to look quite good. Problem is… it really would be replacing both the D40x *AND* the D80. It would cannibalize the D80 for sure. Then again, Nikon could offer the D60 as a replacement for the D80, and bump up the D80 to fill the gap that exists now between the D80 and the D300. The D200 is two years old, and with the introduction of the D300, the D200 is sitting in limbo. Convert the D200 body into the D80 replacement (with a 3 inch LCD, sensor cleaning system, and liveview), add higher ISO capability, and voila! you end up with a good Canon 40D challenger. That’s the camera I’d like to see unveiled at PMA and Nikon can do it right now! 3 inch LCD at high res. Perfect D80 replacement to sit in the middle. But, would it undercut D300 sales? Nikon can’t afford that. So… expect less. well, as for me. i think nikon is not yet filling the gap between starter kit d40 and the mid-priced d80. wheres the real upgrade to d70s????????? six-megapixels nikon dslrs will not fade away just yet (considering the positive worldwide growth sales that nikon is enjoying. nikon has a market niche in that segment. im confident that they will most likely launch the “d75” – six-megapixel, has camera-lens cpu, wireless flash capable (same as d70 and d80). (i hate big raw file from 10megapixel. 4-5mb raw file from 6mp cam is just sufficient for most of us. thats gonna be a true classic upgrade for starters and mid enthusiast. value for money over performance wise. hope you hear us, nikon guys. Ricky – sorry, the D70s has already been replaced – by the D80. The D40/x are in a new cheaper class. Also, the D200 will die as soon as the D300 reaches sufficient momentum. If a D60 actually does come out soon, it will likely push the D80 replacement more upscale. Instead of a D90 coming out at $1000, it may be more like $1200. Which would bum me out, cause I’d like a D80 but with some minor improvements (better metering/highlight preservation, 4-5fps, CMOS, 3″ nicer LCD). And I don’t want to spend more than $900-$1000. But even if it does go upscale, Nikon needs an entry-ish model with a focus motor, that’s not that big. I really highly doubt weather sealing and a large body would be part of this package. However, live-view, big 3″ screen, 12mp CMOS, active d-lighting, slightly bigger than the D80 (maybe D50/70 sized again). But I’d be pretty surprised to see the D40x replaced before the D80. It’s just too new. I heard from retailers that d40x will now stop its production but 6mp d40 will still remain in the market. (entry level to mid-range market). – ccd is nice but cmos censor would be most welcome.hehe..
– oh, censor self-cleaning as well. an 18-70 VR or 18-135 VR!!!! The D60 is all but confirmed. A replacement for the D80 has to be in Nikon’s plans. which will will be a pared down D300! I just came back from a big photography retailer here in Paris and he told me that the shop opened a new entry in their system for Nikon D60 (to be announced in few days maybe?) with a kit lens of 18-55 mm for 800 euros!!! Well, I was just about to purchase the D40x but it is now official that the D60 is coming in February or March. Ritz started taking pre-orders at $ 749. That’s the same price as the D40x but with lovely improvements such as the VR lens and oh yes, dust removal. D60 vs. D40x – a no-brainer. Unless the D40x drop considerably in price. Me, too! I was likethisclose to making a D40X purchase. Now I will patiently wait for a D60! You said this is a “hands-on preview”. A cut and paste of a press release isn’t a “hands-on”, fanboi. @Gary Abbot – That’s what DPReview calls it. I just link to it. I think that’s pretty clear though. Let me know if you have other suggestions. PS I do the same thing with my first checks of the new year! @Maryann – Yeah, I’m pretty bad about new year dates until March or so. Thanks for catching this and pointing it out to me. Does anyone know, what are the differences between the D40X and the D60? Are they significant differences? @anatoly – I think the biggest difference is the packaging of the kit lens with VR. Other than that, based on the reviews that I’ve read, I don’t think the differences are really significant from a purchasing decision. Mine is scheduled for delivery tomorrow. I’ll post some preliminary impressions next week after I’ve had some opportunity to shoot it some over the weekend. Nice camera and your site is fine too. I gota lot of useful information and helpful tips. Hey Guys, I have been readyn all your comments, I was looking for some information about my new camara I wanted for my birthday. My husband bougth me a D40 and I didn’t like it, ( I wanted a D40X or a D80), so he went and exchange it and brought me a D60, I will be taking photography lessons and wanted to know if I should keep this camara or send the poor man to get me what I really want. What do you think? @busybee – I think the D60 is a great camera. I think the D60 will do more than the vast majority of amateur photographers could ever ask of it. Whether it’s the one for you, however, is a question only you can answer. What are you missing in the D60 that the D80 has? I think that is the question you should be asking yourself. As for me, I still shoot with a Rebel XT most of the time, and it does everything I need. Thank you so much for responding so fas Eric, I had been shooting my pic with a little camara a sony cyber-shot. I guess at this point any DSLR camara is good, I wanted an opinion of someone who knew a bit of camaras, I guess since I am not getting anything for the next five years for my b-day (except cake.lol) I wanted to make sure that all his money was worth what he paid for (that was another thing I got sad about, the price), He always wants to buy the best for the best, I had seen a Kit on line that cost about the same as this cara he got. The kit had extra lens, tree filters, flash, a carry on bag, a hard case, memory cards, trypod, a little one, and he said its all just to good to be truth, (have you seen this kind of kids on e-bay with a seller name sunshine? ), hope you have the chance to see and let me know what you think. Thank you in advance. @busybee – I think I saw the kit your were talking about on ebay. Like this one? Frankly, most of the stuff in that kit is junk. I think you are better off sticking with one of the online vendors that I recommend in the post above. You should always be cautious when shopping on ebay (see this post for why). Buying from a reputable seller may cost a few dollars extra, but you can sleep easier know that you aren’t getting ripped off too. is the Nikon D60, better than the D70? we wanted to know which camera stands best? I’m considering (finally) upgrading from a D50 I’ve had a couple of years to the D60. Other than going to 10.2 megapixels from 6.1, what I am gaining by upgrading? I can’t seem to find anything comparing these two.